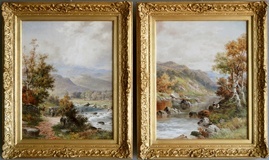 Henry Hillingford Parker was a landscape painter born in the Midlands in 1858. He appears to have spent most of his life in London where he studied at the St Martin’s School of Art. 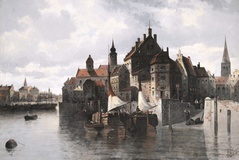 Although he started his working life as an Illustrator for the Illustrated London News, by the age of 23 he had become known as a landscape painter. 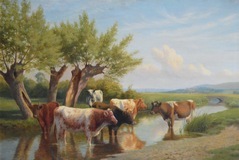 Parker mainly painted rustic views of the South East of England, in Surrey, Sussex and Kent as well as views of the Thames. 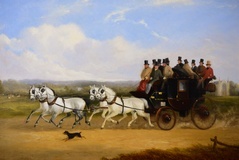 He also painted in Worcestershire and Wales. His style, with its quick and impressionistic brush strokes has often been compared to B. W. Leader. 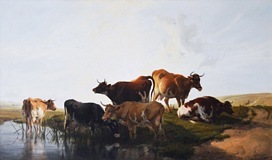 Like many of his contemporaries, he concentrated on painting "pure" landscapes, a genre that he mastered early in his career. 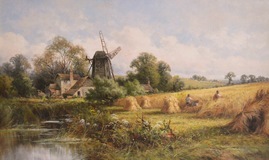 His landscapes are lush and tranquil, frequently featuring figures in a cornfield, on a boat or walking down a country path. 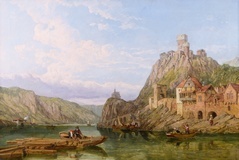 The scenes are often sunny and bright and the waters are calm and soothing. 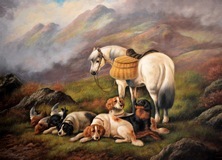 Parker is one of the few top calibre artists who does not appear to have exhibited in England, although his works appear frequently on the market and are as popular today as they were in his lifetime. 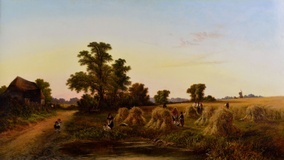 Examples of his works can be found in the Birmingham, Bradford, Eastbourne, Hartlepool and Liverpool Museums in England, as well as art galleries and Museums across the world such as St. James’s Museum, Montreal, Auckland Museum and Melbourne Gallery.